Merry Christmas and Happy New Year to everyone! I hope you had a great winter and a great year. 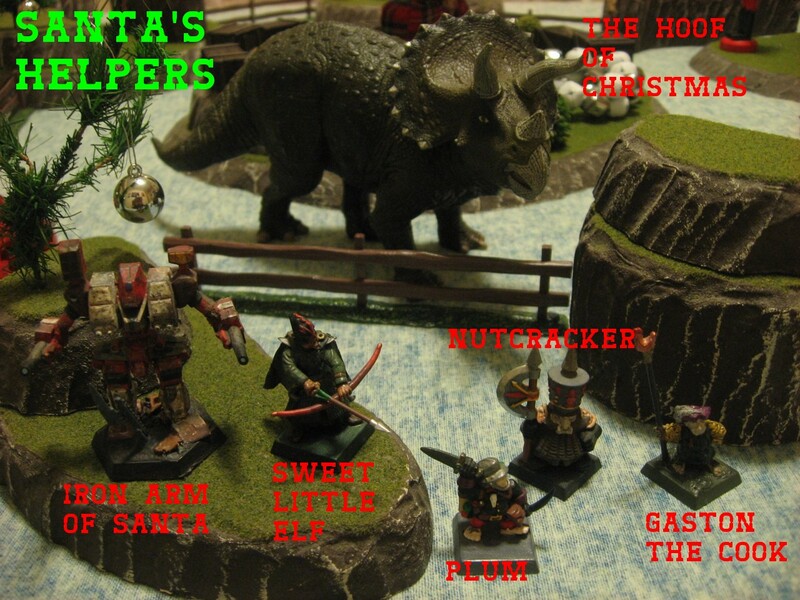 I printed a bunch of posse rosters before my Christmas vacation, and intended to play a game of Dinosaurs Cowboys during that time. But family, friends, and general life got in the way, so I’m retroactively scheduling this report for Christmas day (when I really wrote it January 5th :) ). We’re kicking off our fun old fashion family Christmas by heading out into the country in the old front-wheel drive sleigh to embrace the frosty majesty of the winter landscape and select that most important of Christmas symbols. 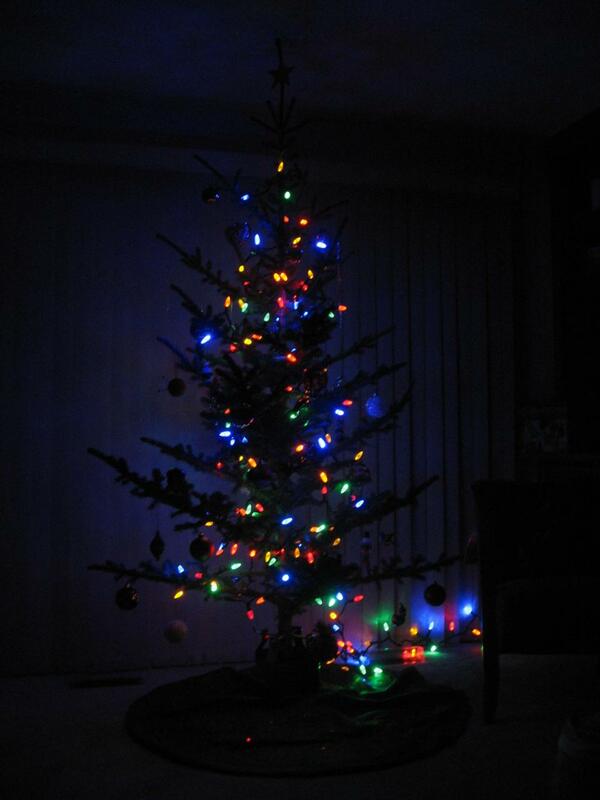 I actually cut down my own Christmas tree annually with my family, because it’s a really fun tradition, and until I got a van it was hilarious fitting the tree on the roof of my subcompact. This years is pictured below to the left. 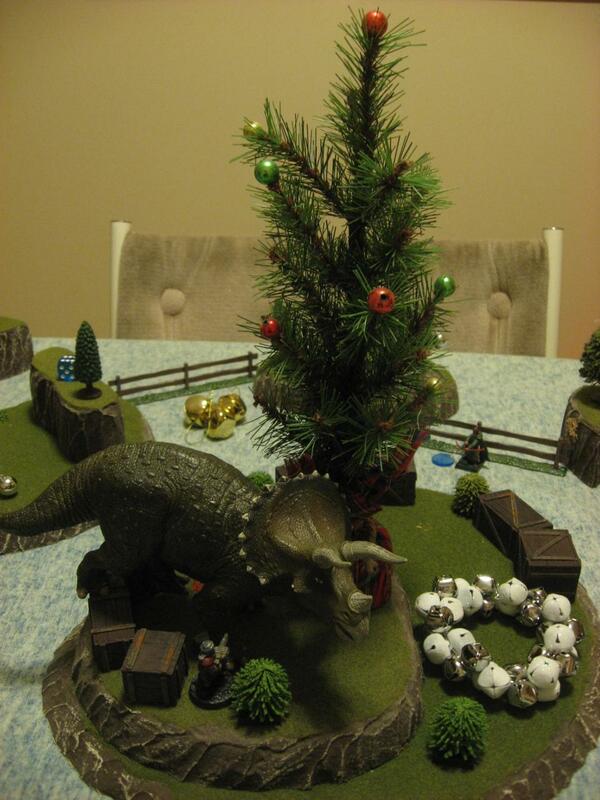 So translating this to Dinosaur Cowboys was a snap: the Objective would be Capturing a Christmas tree in the middle of the field. 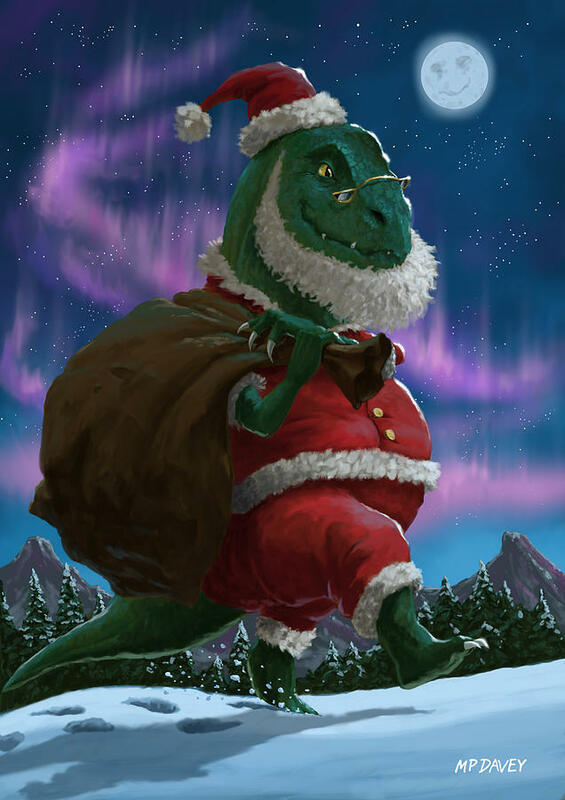 The four Griswold family members would be involved and their dinosaur would be blue and named the Front-Wheel Drive Sled. Who to fight though? Surely not Santa, for his powers are too great (for some reason I could see Will Ferrell saying that line, haha). How about Santa’s Helpers? 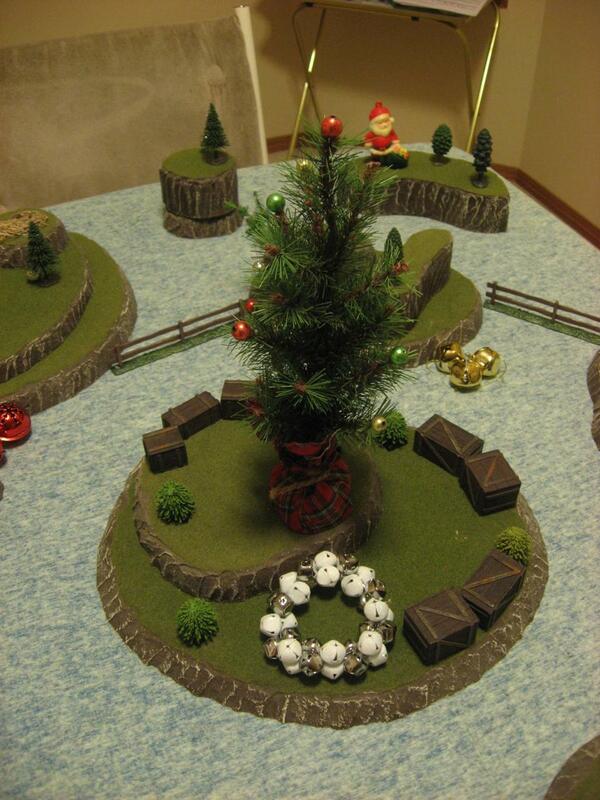 What about if they’re led by an old Battletech miniature renamed the Iron Arm of Santa? Maybe there can be some elves and a nutcracker? 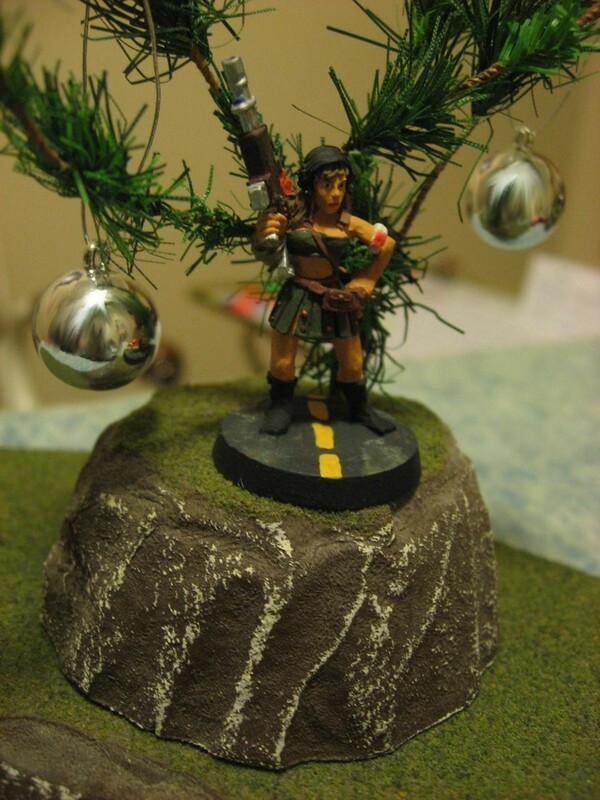 Anyway I meant to do a Christmas report last year too, but really didn’t find the time. This year I was able to find a winter-y enough looking fabric sheet by flipping over my naval ocean mat. Why do I have naval stuff? 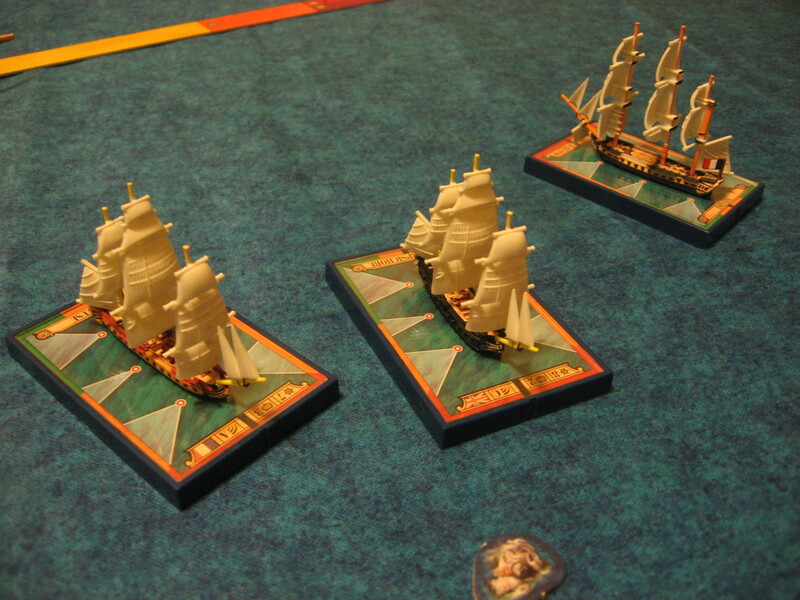 Why for the terrific game pictured here called Sails of Glory. 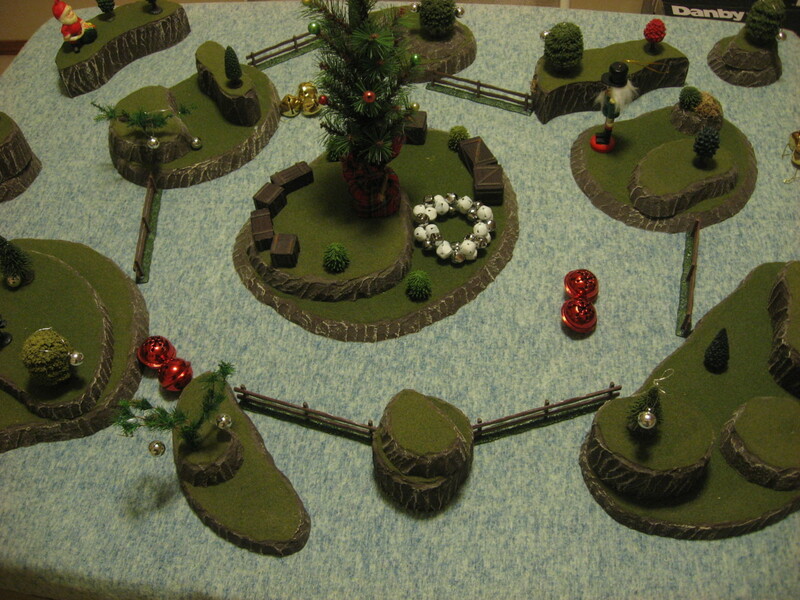 Then I used some small ornaments on my classic model trees, had a Christmas tree that fit well from a craft store, and put a few statues and bells out for cover. 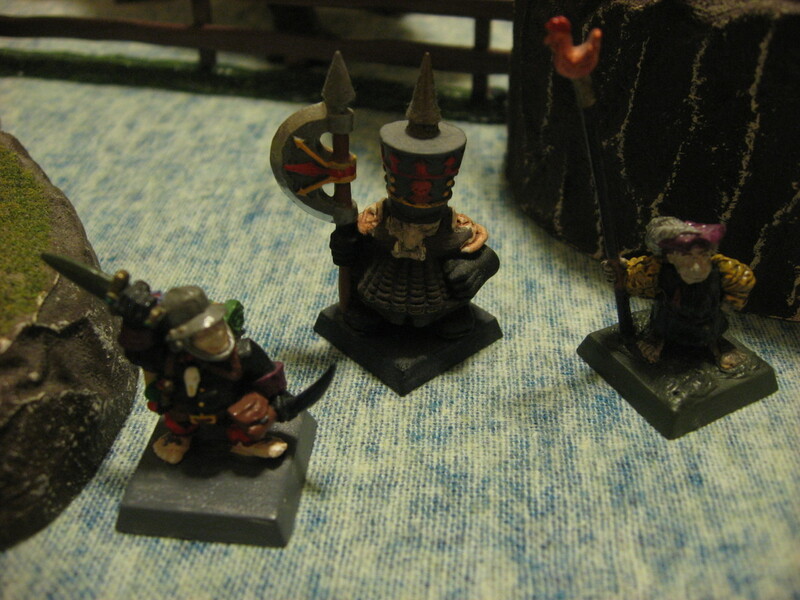 Anyway onto a battle report that turned out to be everything I hoped it would. I gotta admit, I’m super happy with how the table turned out. I took the leaf extender out of my games table to get back to the classic, homely, warm feeling of my traditional 4’x3′ kitchen table. Pretty hard to not cheer a little bit for these guys. Clark spared no expense for his O’Sullivan Sixer (one of my favorite pistol names as of v2.6), and has a motivational speech prepared with the “Get in There!” trait. 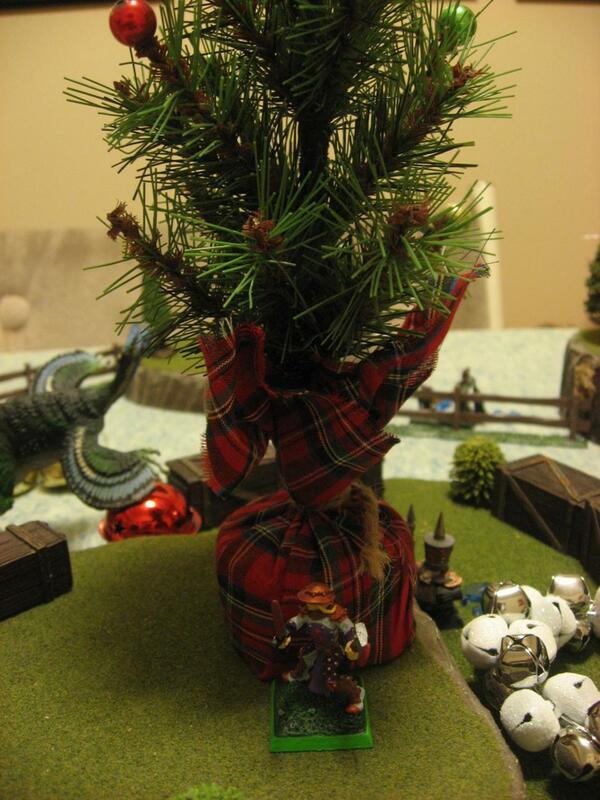 And unlike the movie, this time he did remember a way to cut down the tree! A terrific Mountain Man Axe. His loyal wife Ellen is one of the classic female minis for this game I often name Trista (in fact she was in the first official playtest report of the game). For some reason I can’t make her anything but a sniper, so a Bolt-Action Rifle it is. She similarly has a speech ready for her family, but it’s more calming and soothing (aka “Shake it Off”). Then comes daughter Audrey with a bunch of gizmos and gadgets like a Flare Gun and Stun Grenades. And finally Rusty, who has grown up enough to become a fine shot with the brutal sounding Streetsweeper Shotgun (yeah, it’s a nod to a Quake 2 mod I played ~17 years ago that had a minigun firing shotgun shells). In a pinch he can use the Flagstaff to Motivate and heal the rest of his family. And like I said the dinosaur is named the Front-Wheel Drive Sled. 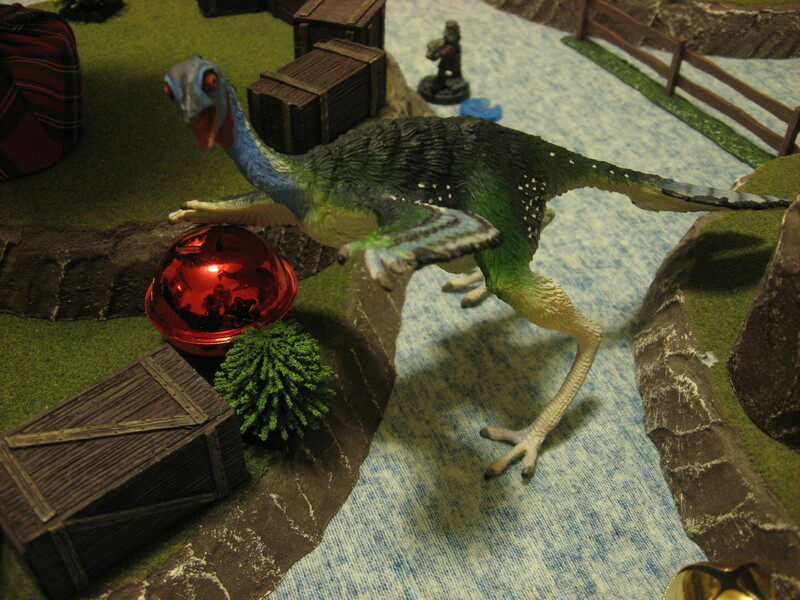 I had bought a new feathery, crazy eyed dinosaur recently, so this gave me a chance to use him. First of all let me explain the mini used for the leader. 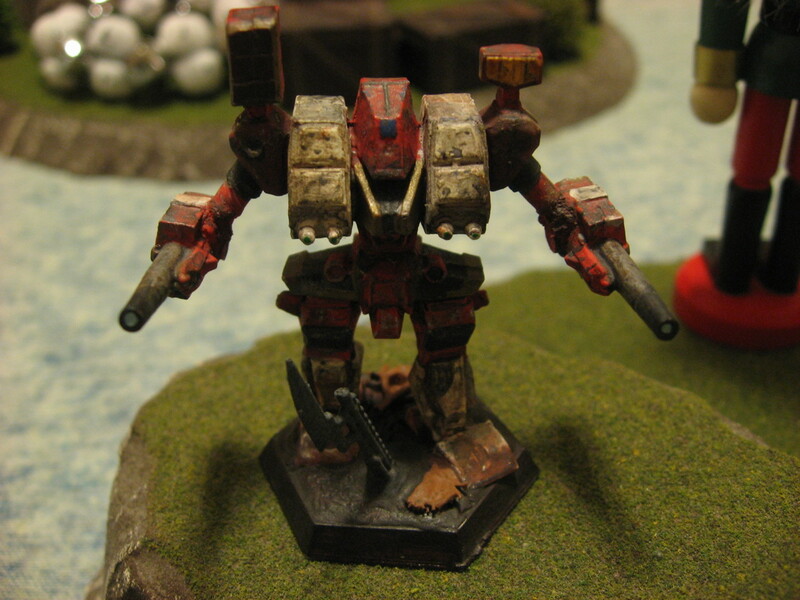 As I mentioned it is a Battletech mini, a game I played a ton in high school and still own and would play again. The exact Mech is a Warhammer IIC (considered “unseen” due to lawsuit issues with FASA and an anime). I gave it as a present long ago to my Grandad, say when I was 12 or 13 years old. 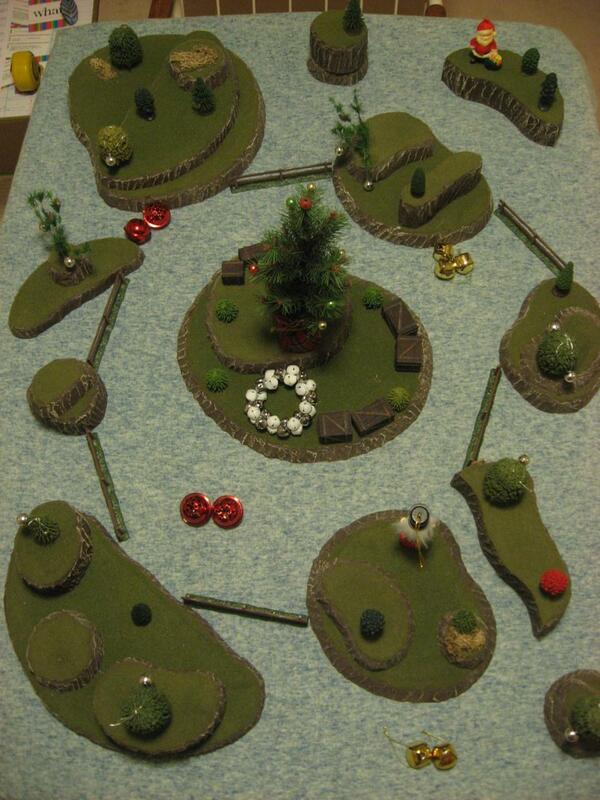 Then when I got back into Battletech when I was 18ish he was kind enough to give it back. I repainted it from the original winter camo (which would have actually been so suiting here) to a nice red/white color scheme with a bunch of dirt and ding marks. And yeah, I basically love the mini, the sentimental value, and the actual stats in the game (more so the original 3025 Warhammer…WHM-6D for life). 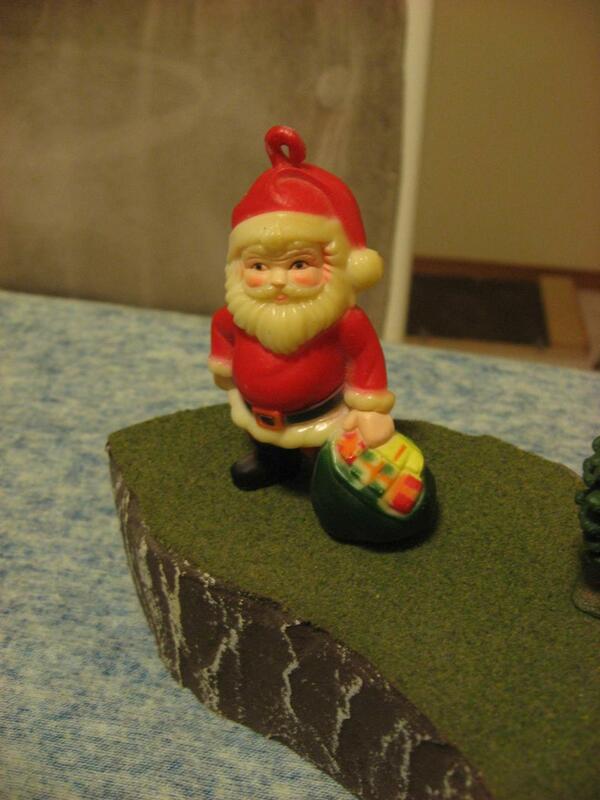 Anyway he would be the Iron Arm of Santa, with a Klondike 7000 (a pretty Christmas sounding weapon). Then for my Christmas elves and helpers I went more to the fantasy shelf. Plum Appleseed is an old D&D RPG thief I used (he has red and purple coloring to match his name). Gaston the Cook is his pal, and the chicken topped staff the mini is holding is perfect for the rarely used Dinocatcher. 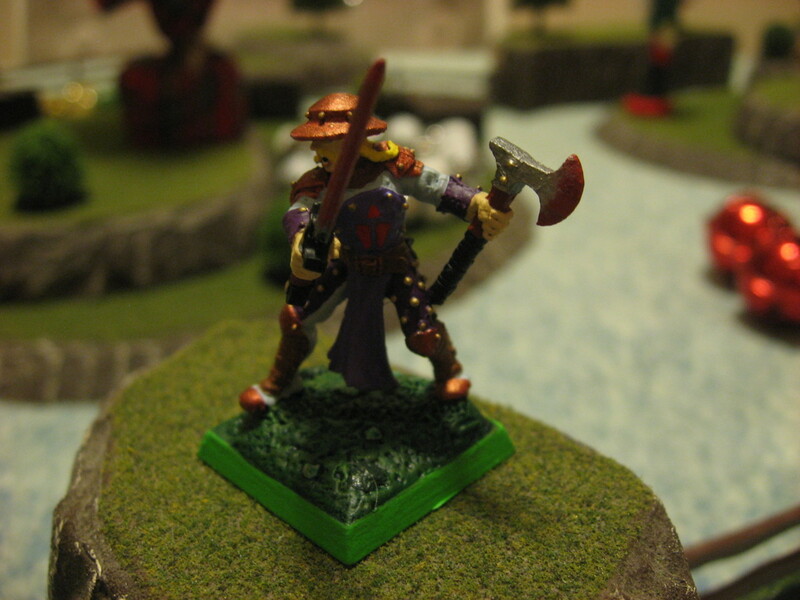 I have a bunch of dwarves, but I dug up an old old old plastic single-pose Chaos Dwarf I painted when I was ~14, and this guy would represent the Nutcracker (with a suiting Greataxe). 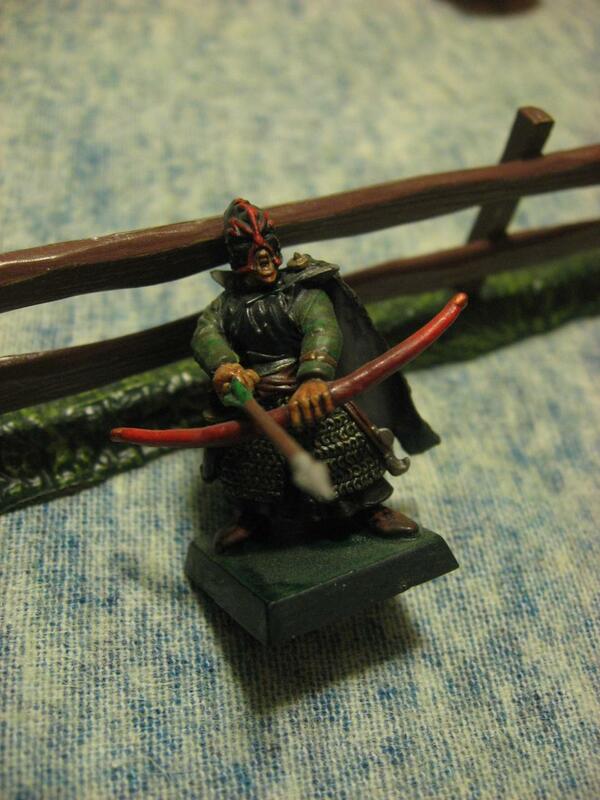 Then to wrap it up an Elf, which I hummed and hawed over for a while since I used to be hugely into elven archers/rangers for RPG games, so I had lots of options. This posse would have a Triceratops for their dinosaur, because I actually really like his in-game stats. I decided to go with no special Features for this game, just to keep it simple for the New Year. 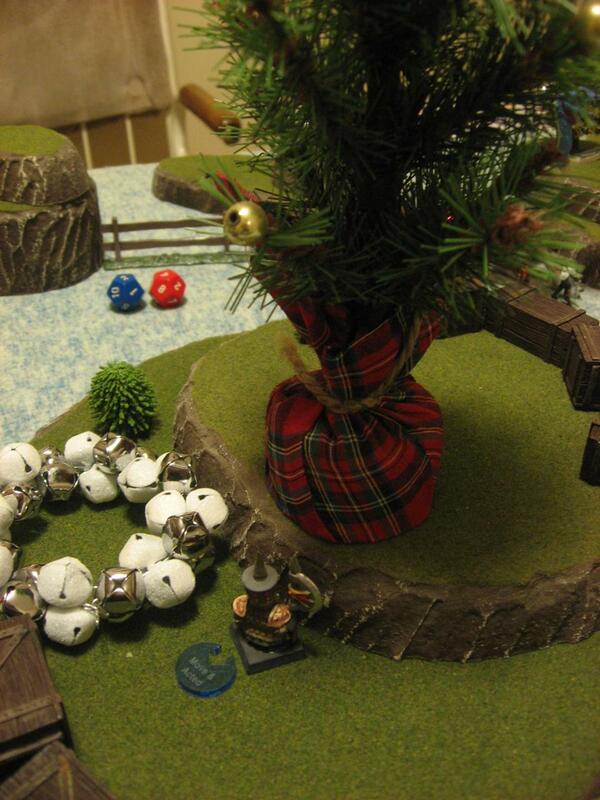 As I mentioned the Objective is “Capture”, with the goal being the Christmas tree in the middle of the table. I decided on a “Corner” deployment (instead of the traditional “Edge”) for a bit of variety, and to encourage flanking/splitting up. 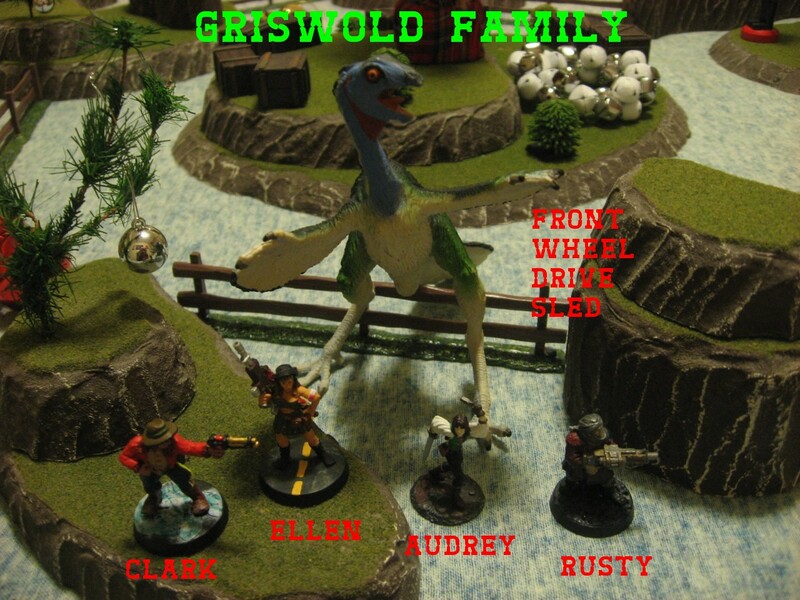 To fit with the movie the Griswold’s started mounted riding in their car…um…dinosaur. Which actually works well for the game because the ol’ sled has the Racer trait, which is arguably the best closing mechanism for melee focused entities (tied with “Climber”). Basically Racer doubles your Hustle speed, meaning the dinosaur could go 6″+5″ (ignoring Difficult Terrain of course as a dino). Not too shabby for a Raptor. 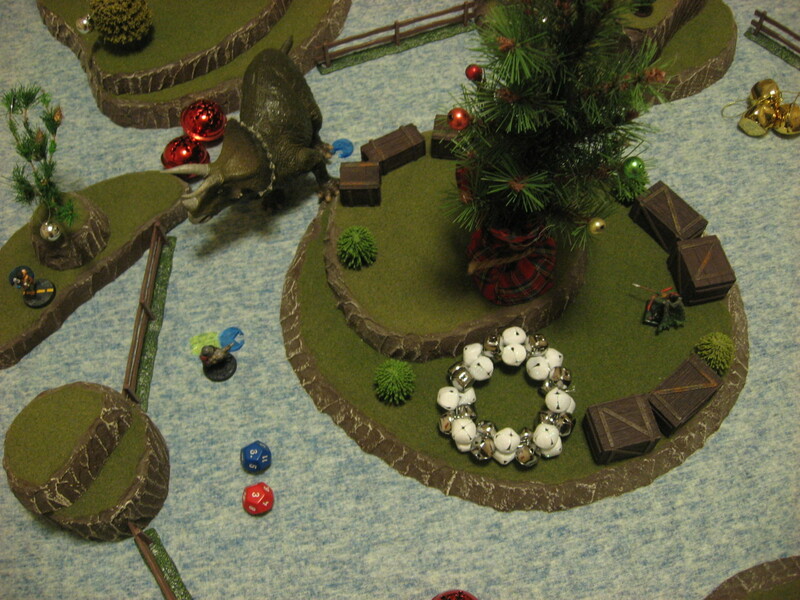 The intent was to launch forward, unload everyone, and quickly secure the objective so Santa’s Helpers almost have to assault the high ground, instead of the fight being on even footing. 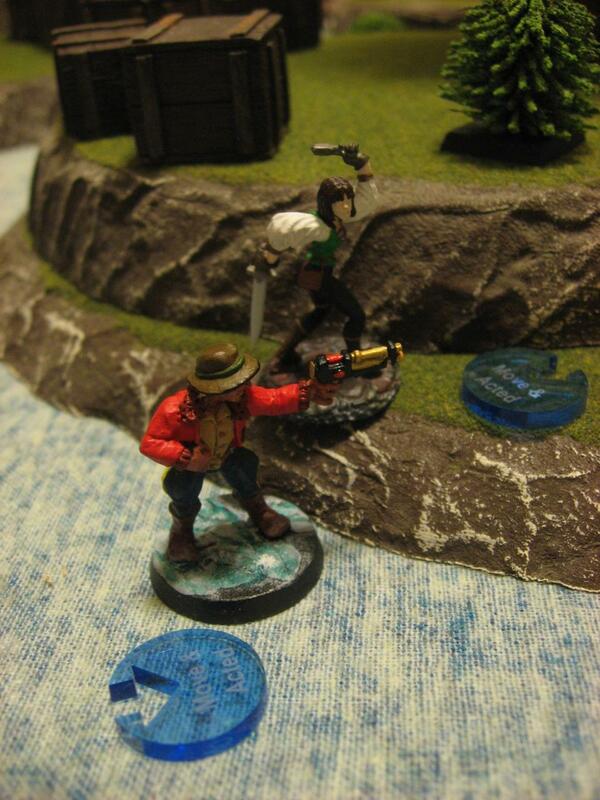 Also I’m happy to say the snowy base I painted for my red jacketed RCMP officer finally suits the table (far right picture above). Santa’s Helpers deployed next, in the corner opposite the Griswolds. 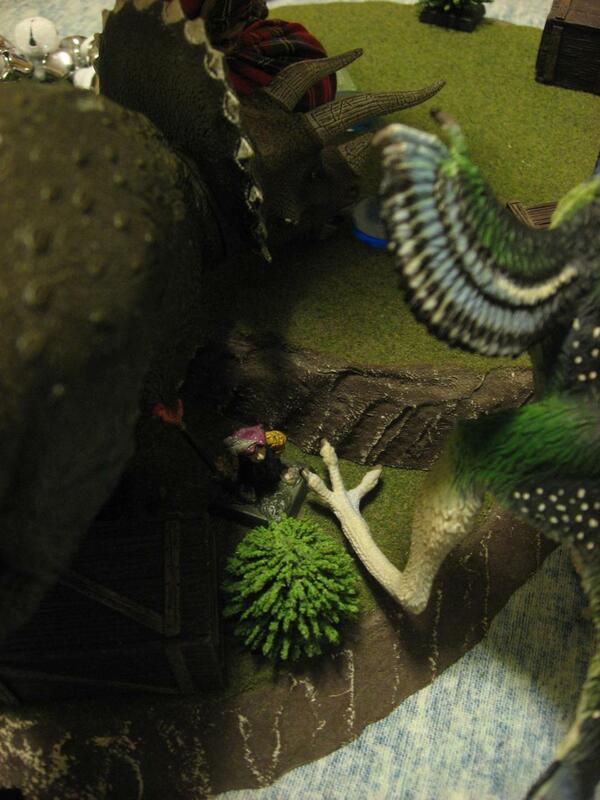 Plum started mounted on the Triceratops, to better utilize his Carbine (thanks v2.6!). The Iron Arm of Santa was out front, hoping to activate last and maybe sneak a shot in. The remaining members were organized in a flying-V behind a tall hill. Their plan was to edge around the cover, cross the nearby fence, and storm the objective. Well, call it a day! Except there are still 5 turns to go. 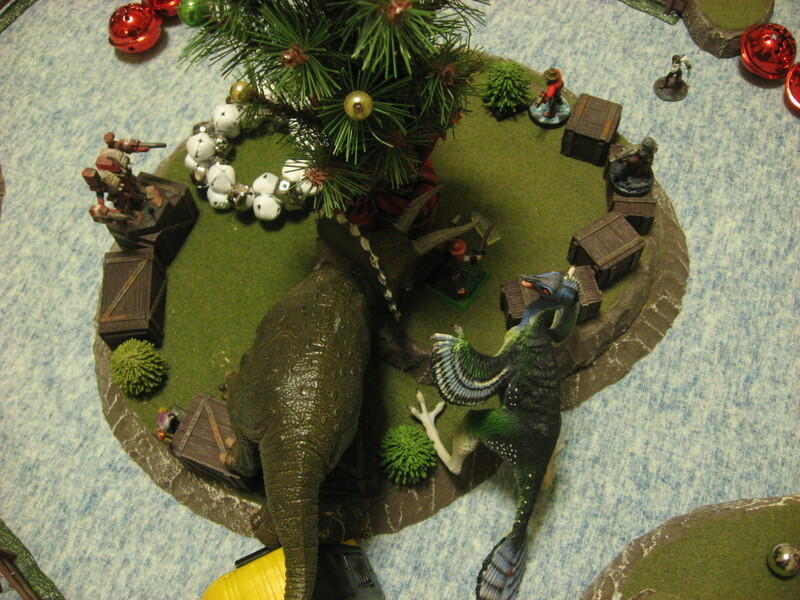 But thanks again to his Racer trait the Nutcracker managed to reach the base of the Christmas tree objective, well within the 4″ necessary to capture it. Before Plum could activate Ellen fired on him, hoping to frighten the rider into Fleeing (and taking his dinosaur with him!). Although she hit very well, Plum managed to pass his Bravery Test. The return fire was ironic as Ellen took enough damage from the Carbine of Plum to force a Bravery Test, which she promptly failed. Meanwhile the posses broke into smaller teams. Clark and his daughter Audrey moved along the side hill near the Christmas tree. Across the field the Elf and Cook teamed up and reached the edge of their covering hill and advanced towards the fence beyond it. The Iron Arm of Santa mechanically shuffled directly forward. 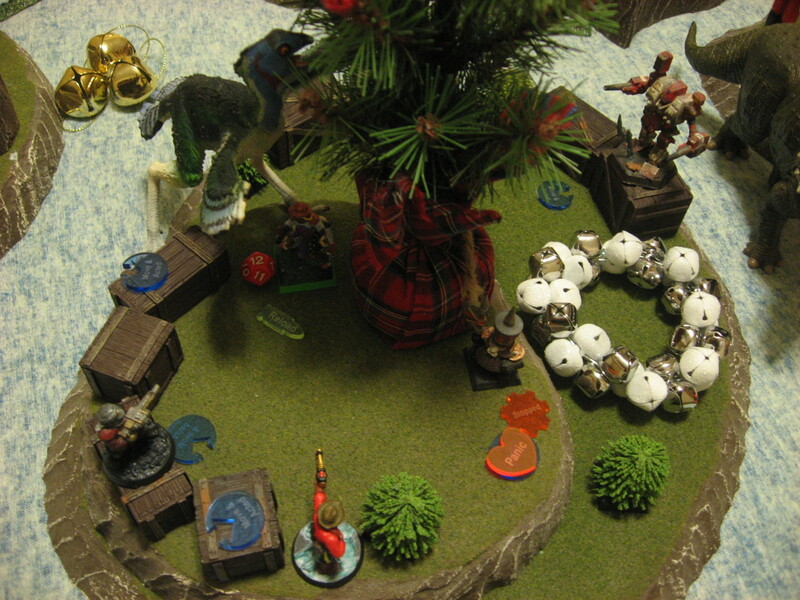 Meanwhile the Front-Wheel Drive Sled boldly advanced around the side of the objective, hoping to reach the Elf and Cook and hold them up in melee before they could assist at the tree. Kevin gave me the chance to make a ridiculous single character that cost $2,610 and 385 IP (hah) with 8 Defense (Hahaha) and 3 Ranged Target Number (HAHA!!!). How about a Grenade Launcher and Settler Defender and slew of useful traits (Awareness, Try Again, Escape). 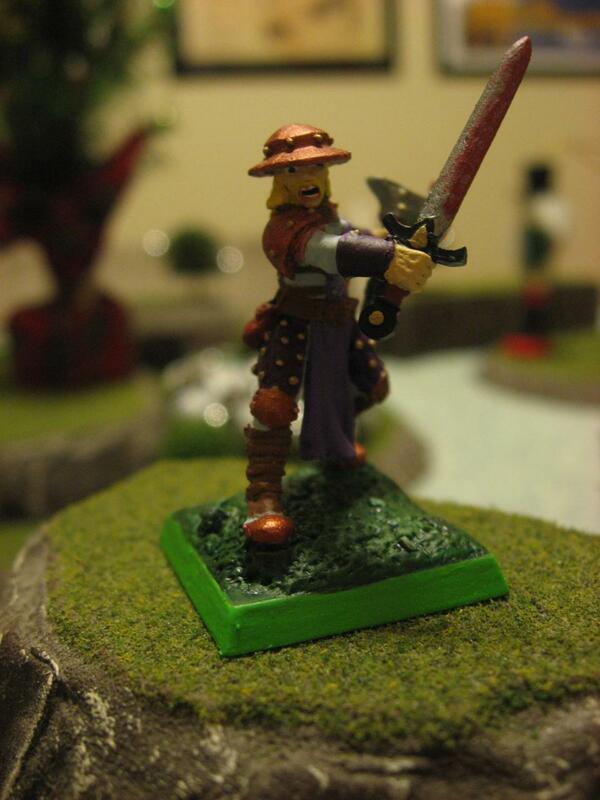 In addition I could use the player character mini (a Scout named Dunhaus) from my recent D&D campaign named “Servants of Molagrath”. 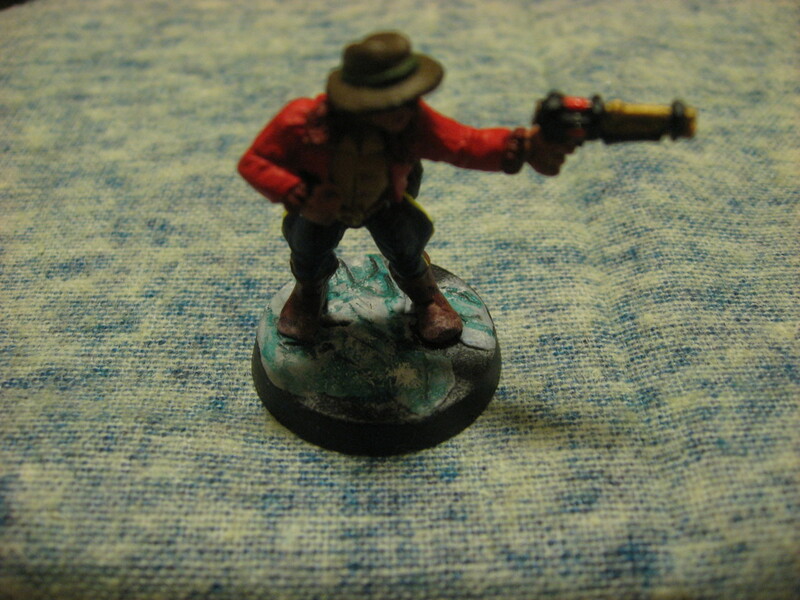 I custom painted this mini for the campaign (which ran for 6 months recently…basically the giant block of no blog posts here). His tunic even has the little evil red beetle cult symbol of his deity Molagrath. And craaaazy eyes. This changed the game drastically. Kevin would attack the nearest entity (regardless of posse) where it made sense. Both posses would completely gang up on him in an uneasy alliance. And before either gang could really chip away at him, he’d hop on a makeshift zip line and get away. But until then he was going to rip everyone apart. 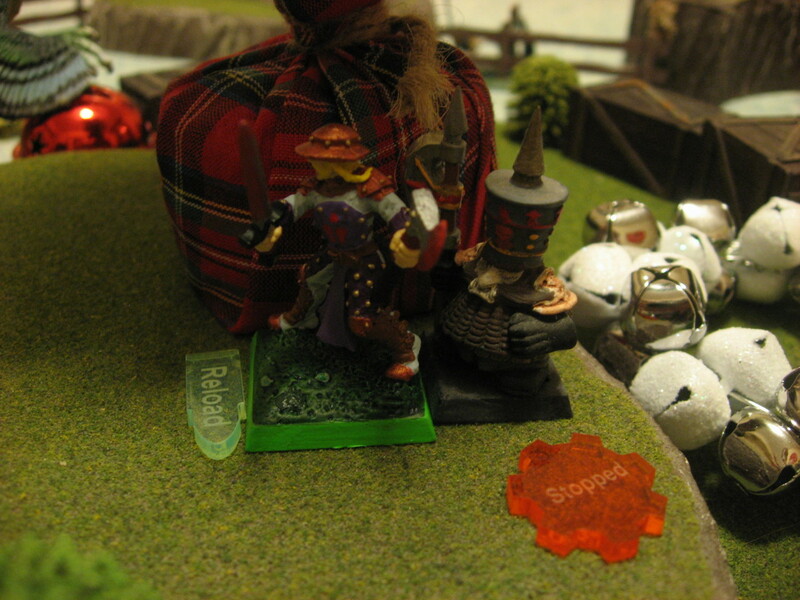 Unfortunately for the Nutcracker, who had raced ahead to get adjacent to the objective, the little dwarf was the nearest target. I’m sure it’ll be fine…how much damage can a Settler Defender at Short Distance really do…with 3 RTN. Needless to say the Nutcracker soon found himself clinging to life with 1 HP. 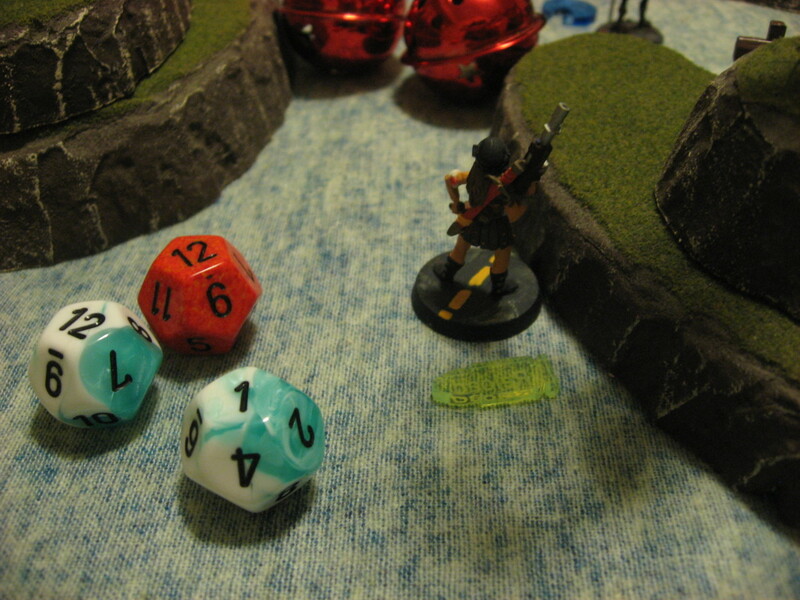 In a way he was a hero though, as Kevin rolled 2 Crits but also that magical, hope granting result of 1, which meant the deadly shotgun needed to be reloaded. 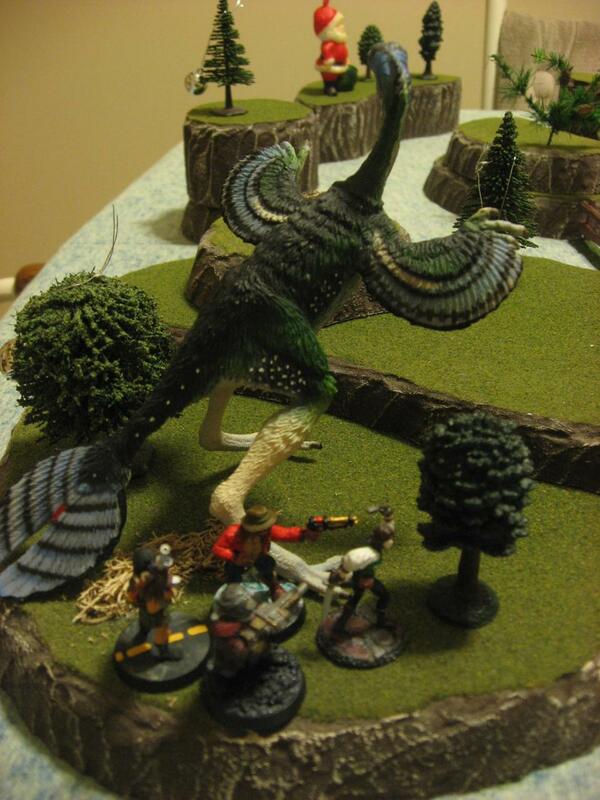 Kevin would roll Initiative just like the other posses, but didn’t quite count for the number of activations. 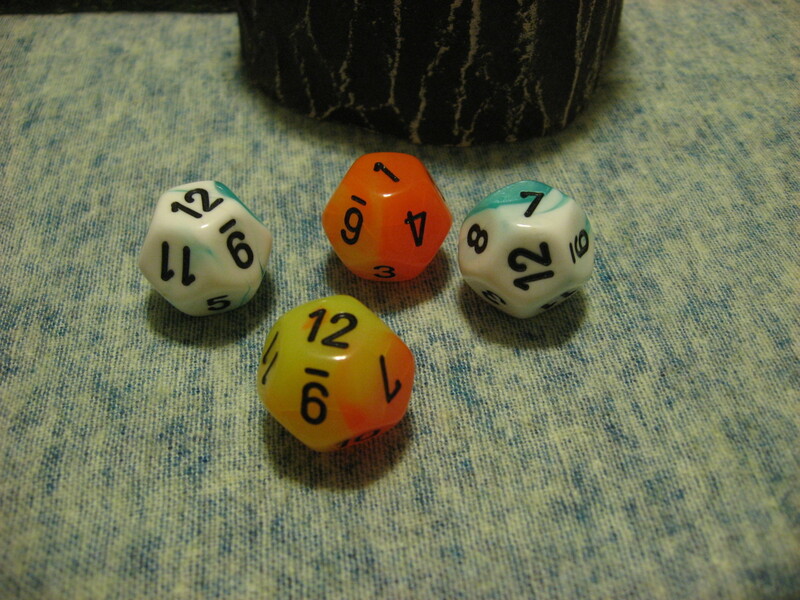 What this means is he would activate once, on the first initiative roll, then not again until the next turn. Which meant if the gangs could weather the initial storm they’d have a full, free turn to shoot at Kevin. 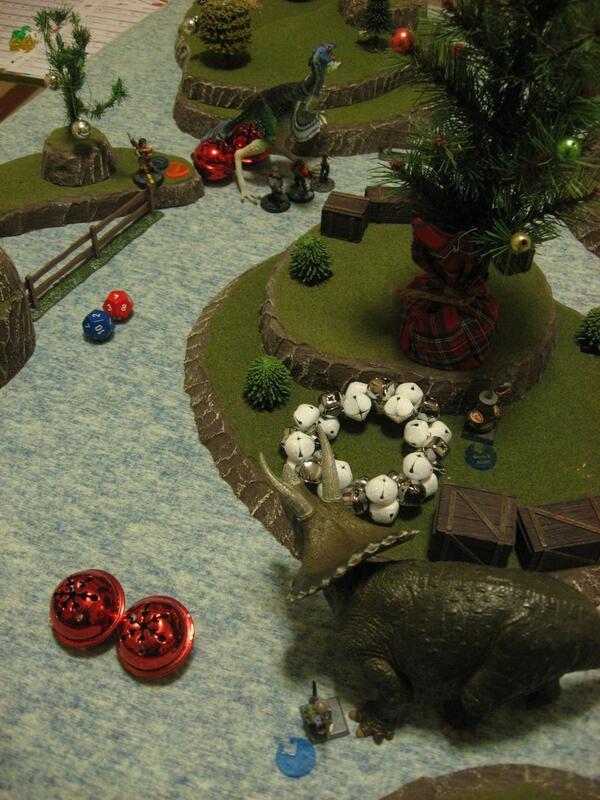 Luck was still with the Nutcracker, as Santa’s Helpers won the all important Initiative roll. Knowing his life was near an end, the brave dwarf roared to the god of thunder (oh wait wrong game) and moved into melee. He used the Turtle trait to desperately try to survive a counter attack. Then he feebly swung his Greataxe, but to no avail. 8 Defense basically meant everyone was hitting on 12+, so they couldn’t get Criticals, and could really only hit on a 1/12 chance per die. The Nutcracker had a bit more luck when Kevin activated. Because his shotgun was empty, the kid needed to get outside the minimum range to use his Grenade Launcher. Which meant leaving combat with the Nutcracker. Shouldn’t be a problem, right? Actually the Nutcracker managed to hit the moving opponent with his Snap Attack, drawing first blood on the seemingly insurmountable target. 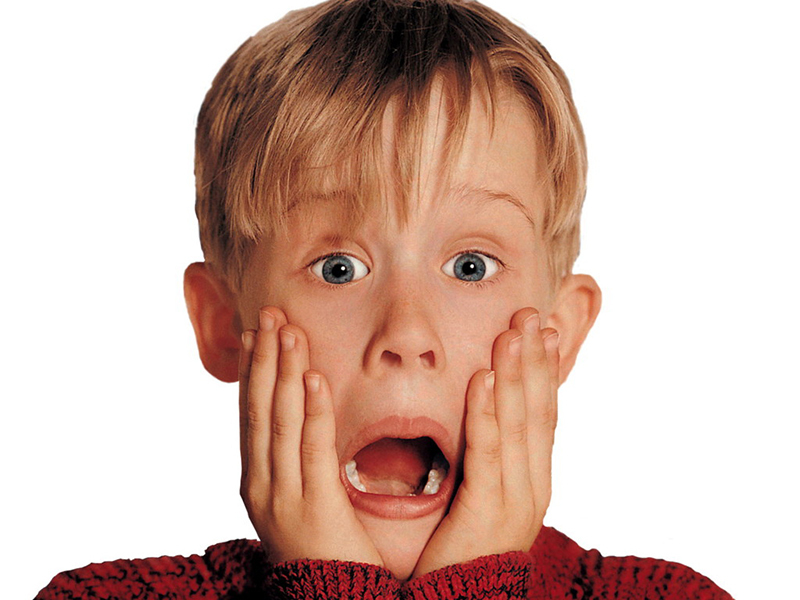 The Griswolds were still in shock from seeing the Grenade Launcher wielding kid appear. And before Clark and Audrey could separate Kevin finished his move away from the Nutcracker and lobbed a grenade at the clumped father and daughter. Yeah, that hit. And it hurt a bunch, leaving Clark at 2 Hitpoints and Audrey at 5. Seeing the grenade explode amidst her family, Ellen dug deep inside to unknown anger. Going “full mama bear” she landed a terrific shot on Kevin, but also emptied her gun doing so. Inspired by the shot, the rest of the posses circled Kevin and tried to hit him with everything they had. 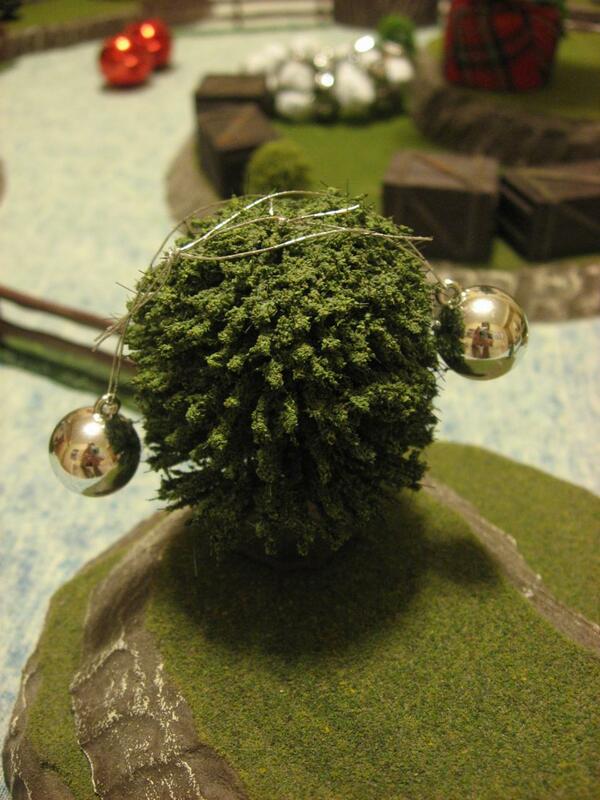 As an added bonus everyone got closed to the tree Objective, haha. The dinosaurs piled in as well in an attempt to hold Kevin in place and protect their masters. It’s not like the penalty to hit Kevin in melee with a gun would really matter when everyone was already at 12+. Kevin activated once more, using his Power Glove (unfortunately not listed on the PDF roster since I had to technically break the equipment size limit rules to let him have a melee weapon). He straight up punched the Front-Wheel Drive Sled in the jaw (grill?) for a bit of damage. Then as quickly as he showed up, he zip lined to safety. Probably calling the police or going through a flooded basement. So in game terms he was done and removed from the match after 3 activations of mayhem. 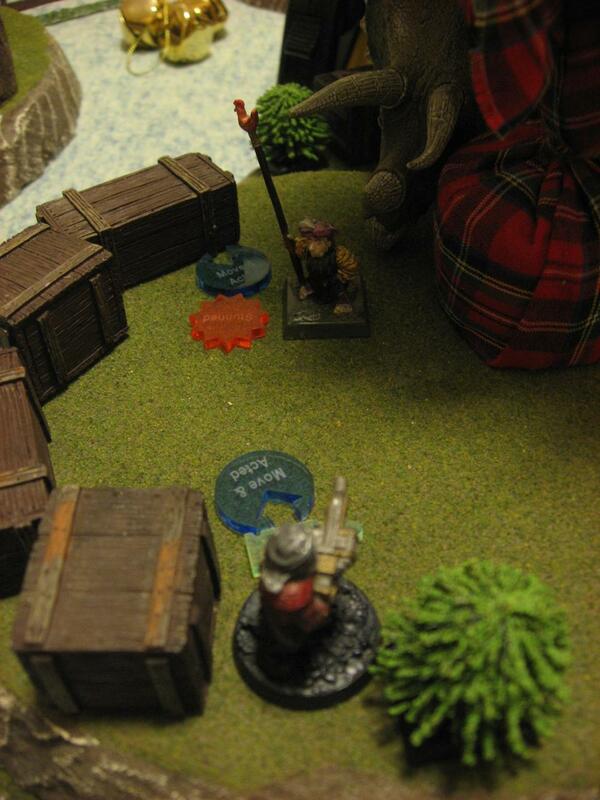 In the end he had 21/35 Hitpoints left, so he took a measly 14 damage. 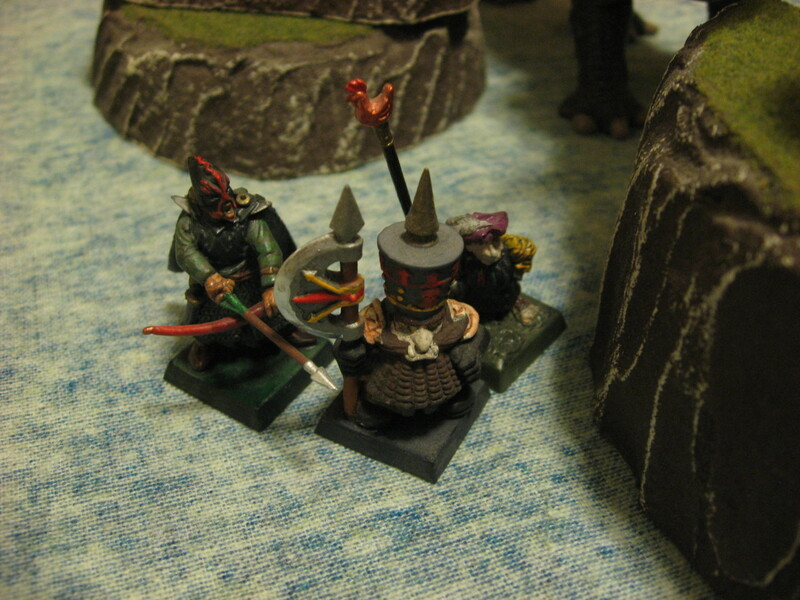 The first activation this turn was rather important. The Iron Arm of Santa had taken a bad shot from Clark, but hadn’t quite died. If Rusty could activate and blast the Leader apart the remaining enemies might Flee from the Objective. And even though the Griswolds won the first activation, Rusty unfortunately seemed to forget how to shoot. Seriously the dude needed a single 9+ to kill the Iron Arm of Santa. And Yeehaw! had been used much earlier (I think on Ellen’s first shot when she tried to make Plum turn tail and Flee). And this was with Both Barrels being used on the Streetsweeper Shotgun! As the Iron Arm survived, he was able to move over and take Clark out of action. The Griswold family stood strong though and neither Rusty or Ellen failed their Bravery Test. 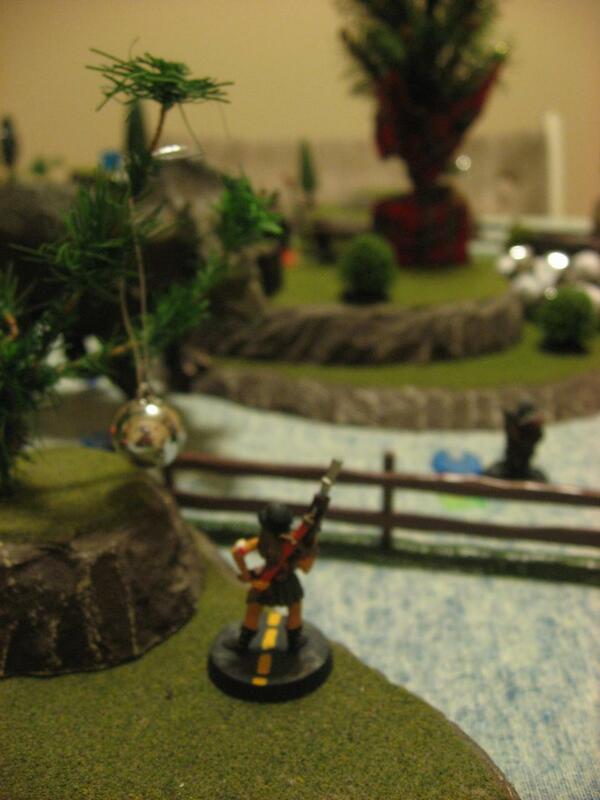 Meanwhile the Elf kept moving forward towards the Objective, his progress slowed slightly since he wasn’t full out Hustling and instead launched silver bolts of energy from his Laserbow. 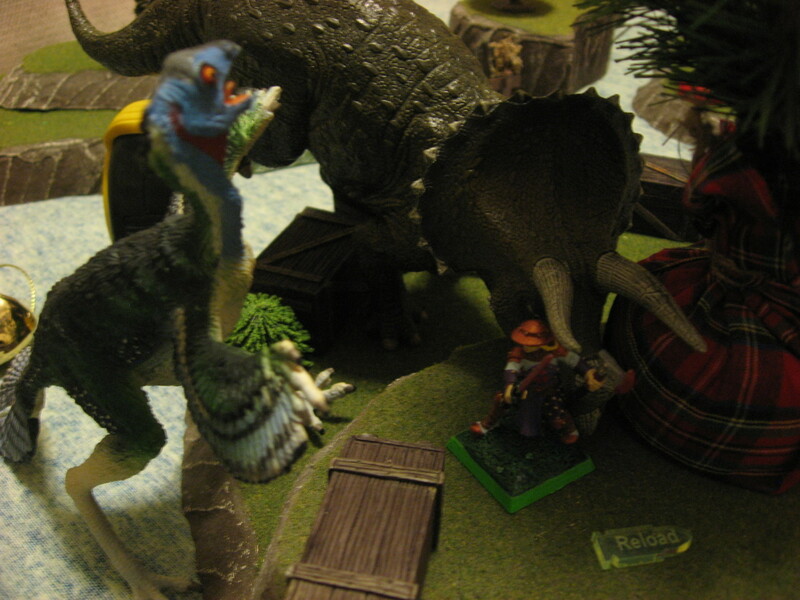 The Cook dove in near the brawling dinosaurs to assist the Triceratops. Honestly though the Front-Wheel Drive Sled (Raptor) was pretty badly hurt, and was clearly outmatched by the larger dinosaur. 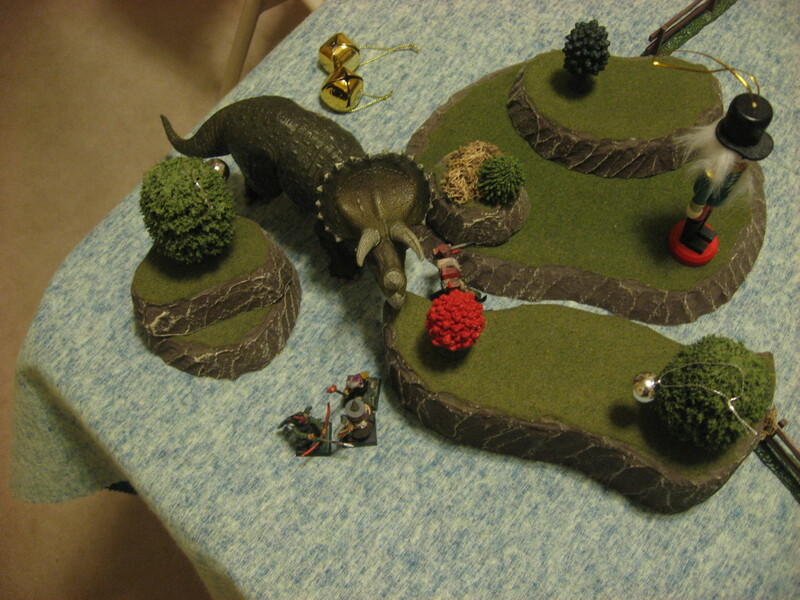 But the sooner the Triceratops could safely leave combat the sooner it could reach Ellen or Rusty. Speaking of the dinosaur fight the Cook did manage to finish off the Griswold family vehicle/Raptor. Since the Cook had been untouched so far, Ellen focused her shot on him. She climbed up the slight hill nearby to get a better line, and landed a beautiful shot that forced the Cook to Flee. She also looked awesome doing so. The turn started with one of my favorite subtle mechanics of Dinosaur Cowboys, and one that catches even experienced players sometimes. That is if a character cannot fully Flee, they are Stunned instead. So basically they lose their Action Phase instead of their Movement Phase. And this is exactly what happened to the Cook. Because he couldn’t move his full 4″ due to Difficult Terrain crates and hills, he instead was Stunned. Which meant he could still advance towards Rusty. He just couldn’t attack once he saw him. This turn actually began with the last picture above, which might be obvious since all the Moved & Acted tokens are cleared. 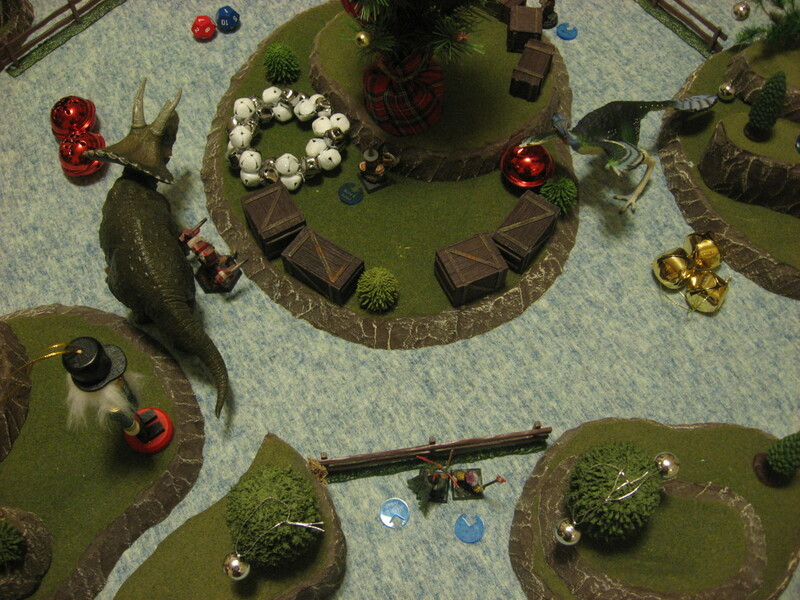 But it started with the Triceratops activating, moving back into the recently Pushed Rusty, and smashing him again with Trample for ANOTHER 4″ of Push. There was no way Rusty would reach the Objective this activation. 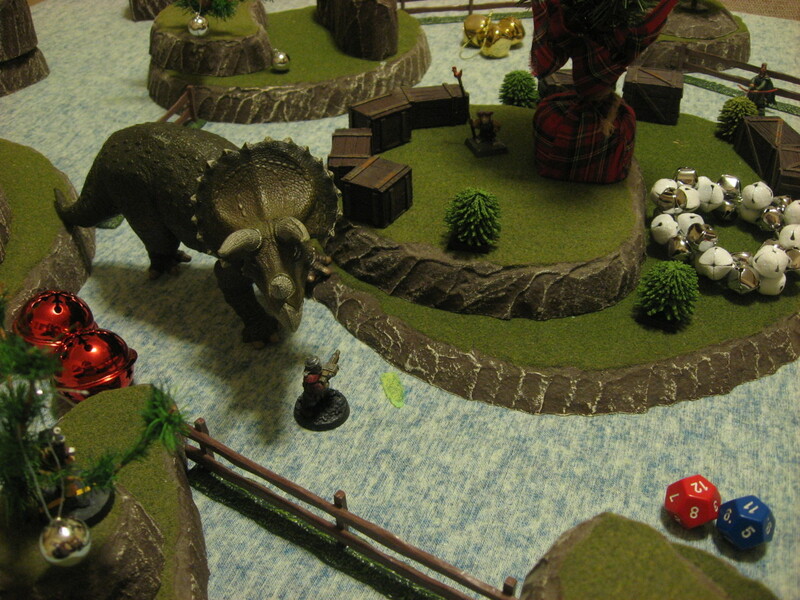 But by pursuing him the Triceratops had also placed itself outside the capture zone. Which meant the Cook was the only person on the Objective. The Elf was close, but had failed his Bravery Test when the Iron Arm leader died, so he was still getting back to position. So if Rusty and Ellen could kill the Cook they might have a chance of a tie game. 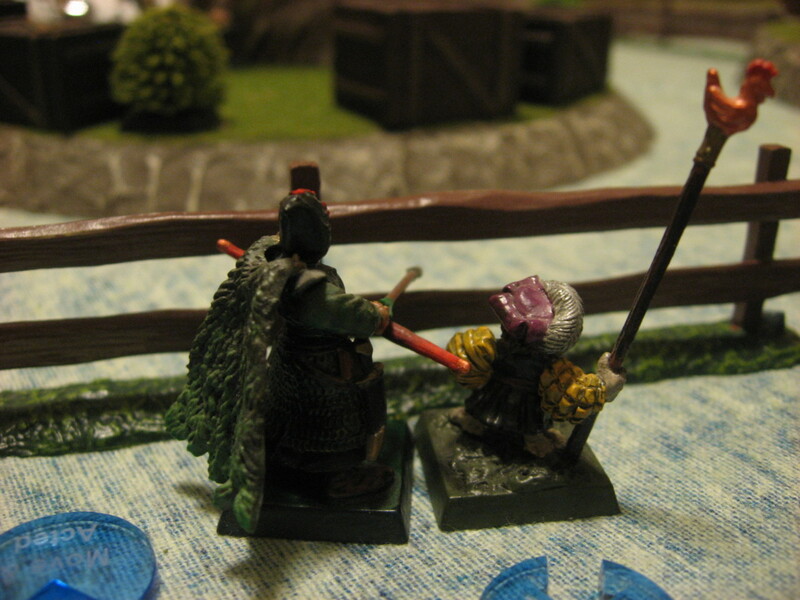 After picking himself up from the Trample, Rusty moved slightly to get into the best distance bracket he could, and used Both Barrels on the Cook, leaving the halfling with a mere 3 Hitpoints. 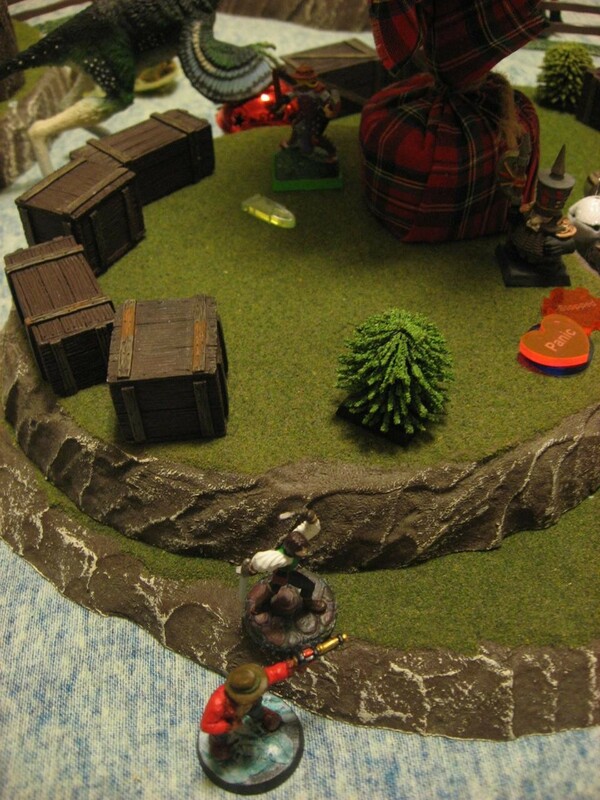 With her Bolt-Action Rifle and combat modifiers she needed a single 9+ on 3D12. Tense, very tense… aaaaand she managed it, killing the Cook. 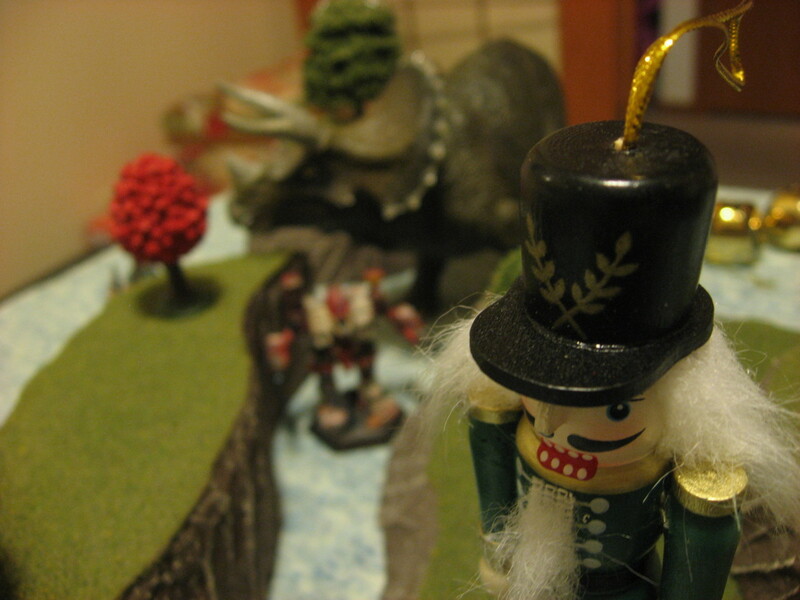 The raging Triceratops remained, as did the Elf. But the turn limit was reached. 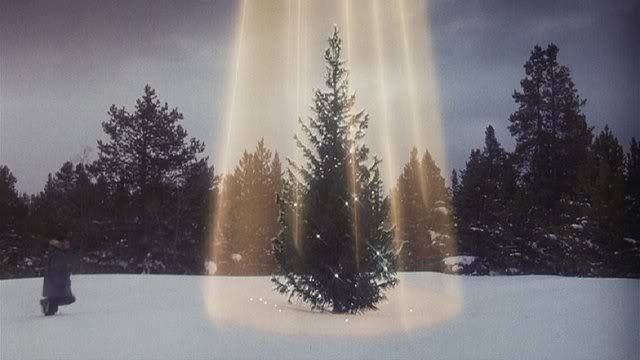 There was only a single activation left, of that Sweet Little Elf and his Laserbow. 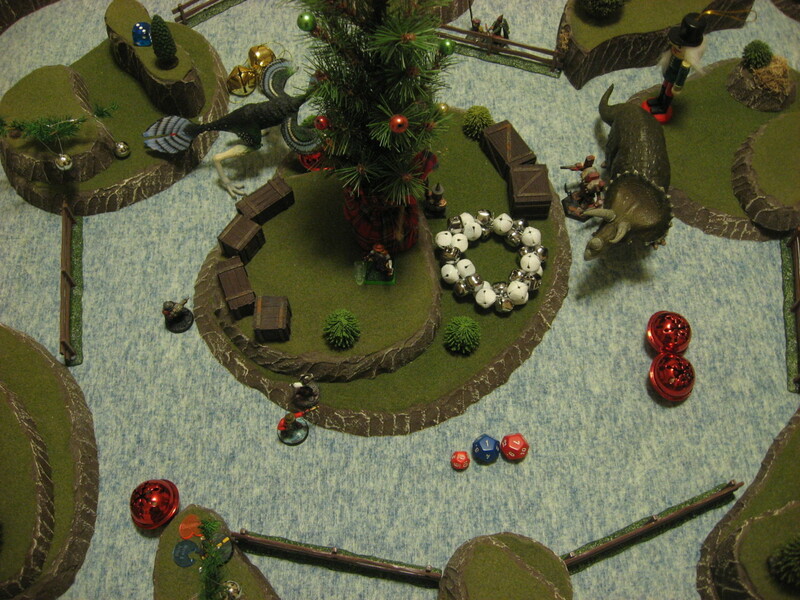 And with a Hustle he was just BARELY able to get within 4″ of the Christmas tree Objective. No one else was even close. So Santa’s Helpers won! They were able to fend off the fanatical tree cutting quest of the Griswolds, as well as weather the storm of the McCallister kid. Guess what? This match was fun. Not much else to say. 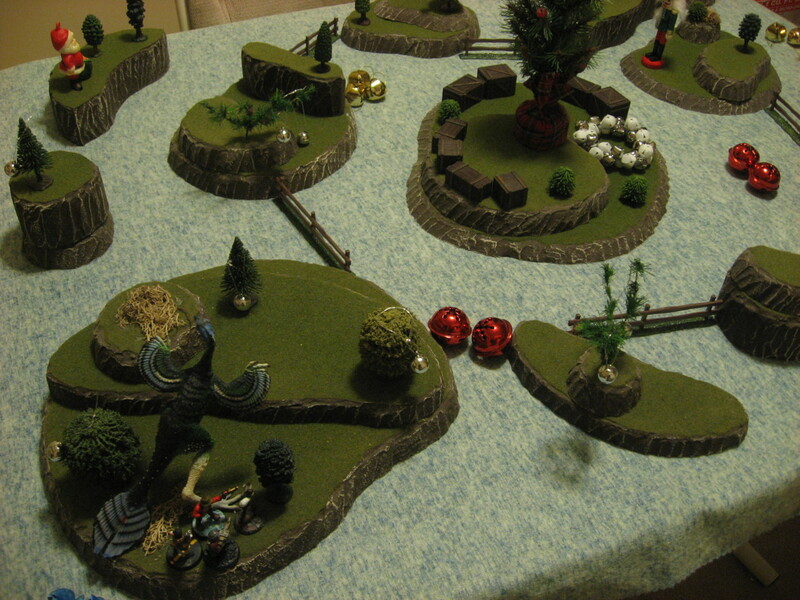 The posses used a lot of neat weapons (although the Dinocatcher and Flare Gun missed the 1 or 2 attacks they tried). The Objective battle was very tense. I’m happy Trample got to shine. All in all there were a lot of tense moments and close calls. 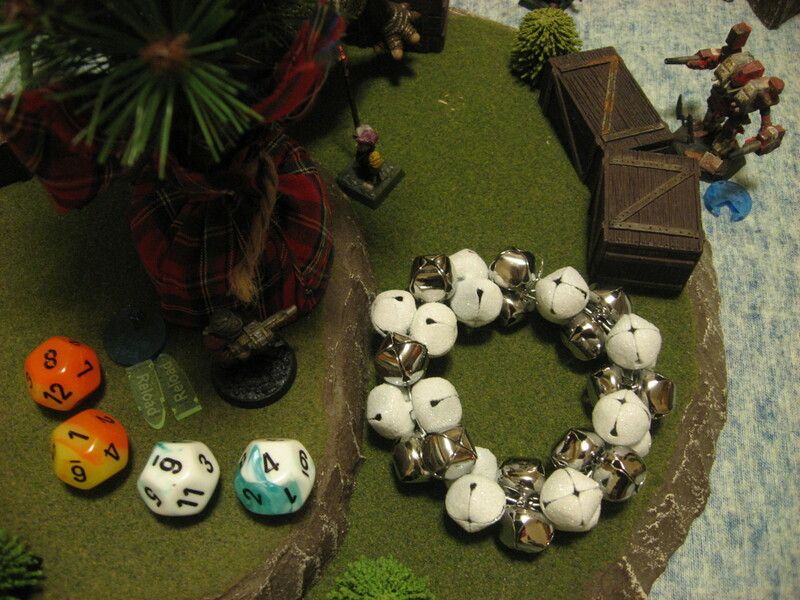 For example the Elf failed his Bravery Test from the leader dying because he rolled an 8 but had 9 BTN (default is 8). So because he gave up some BTN for a few Improvement Points he nearly didn’t reach the objective. Anyway I hope you enjoyed the report. I know I haven’t been posting here a lot, but like I keep saying Dinosaur Cowboys is always on my mind and in my heart, and I’ll keep coming back to do battle reports when I can. They just take a bit of time (around 1 hour to play and photograph, and then 3 hours to write up and format). I actually have another report setup, I just need to find the time and opponent to play. I’m going to flip the ocean fabric seen through this report to the blue side, then have a bunch of islands to represent the new coast of America. Basically some swamp land raiders against a coastal defense force. Otherwise 2016 might be the first year since I first developed the game that I don’t release an updated rules version. v2.6 is in a great place, I’ve been enjoying it a ton. And like I’ve (naively) been saying since v1.0, at some point I need to stop tweaking the game. Although it’s tempting to go back to my roots and release a set of “expansion” rules…maybe called Skies and Slums. Not that I have brainstorming notes on that very topic from March this year :).